A generation on from the BBC Natural History Unit’s series The Blue Planet, Blue Planet II uses breakthroughs in marine science and cutting-edge technology to explore new worlds and reveal the very latest discoveries. This landmark seven-part series will bring viewers face to face with unexpected new landscapes and introduce compelling contemporary stories from our ocean. Over the course of more than four years, the Blue Planet II team have mounted 125 expeditions, visited 39 countries, filmed across every ocean and spent over 6,000 hours diving underwater to bring us closer than ever before to the captivating lives of some of the most extraordinary sea creatures. 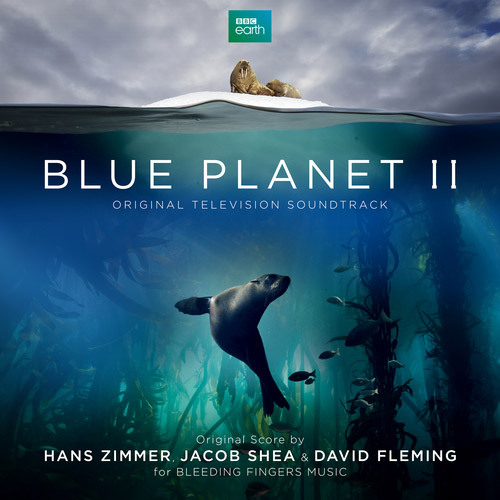 Following on from their soundtrack success with Planet Earth II, the Emmy and BAFTA nominated Bleeding Fingers Music team headed by Hans Zimmer deliver once more their perfect harmony of matching music to stunning images of nature. With over 120 soundtracks to his credit which have grossed 24 billion dollars at the box office Hans Zimmer has been honoured with many accolades, an Academy Award, two Golden Globes, three Grammys, an American Music Award, a Tony Award and The Henry Mancini Award for Lifetime Achievement. His Academy Award nomination for Interstellar marked his 10th Oscar nomination. Jacob Shea is lead composer at Bleeding Fingers winning BMI Awards for Mountain Men and Alaskan Bush People. David Fleming began his career working with the master of TV music, Mike Post, recent work includes contributions to Divergent, Teenage Mutant Ninja Turtles: Out of the Shadows, and Transformers: The Last Knight. “…the glories just kept on coming"
"This underscore celebrates the magic and beauty of the natural world, marking yet another triumph for an amazing series that has inspired nothing but great things from its composers."